An ultra-high-definition action camcorder from GoPro with a MicroSD memory-card slot, and an image stabilizer. The GoPro HERO5 Black is a 12-megapixel camcorder with no optical zoom. It has a color touchscreen LCD. The camcorder has a maximum aperture of f/2.8. The GoPro HERO5 Black stores video and photos on MicroSD, MicroSDHC, and MicroSDXC memory cards and has no internal storage. It captures ultra HD video at a resolution as high as 3840x2160 at 30 frames per second and 12-megapixel resolution stills as JPG files. The image stabilization system for this camcorder is electronic. 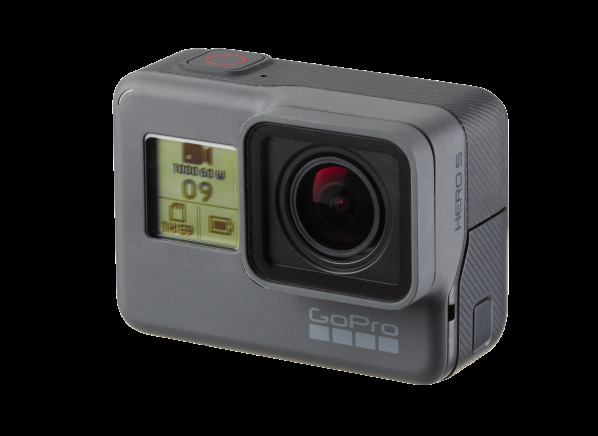 The GoPro HERO5 Black measures 2.5 inches wide by 1.8 inches high by 1.3 inches in length, and weighs 0.3 pounds. Largeness Largeness Because action camcorders do range in size, we have designated them using three groups: compact, average, and large. Models which are considered "compact" fit in a typical shirt or pants pocket. HDMI output HDMI output Has High-Definition Multimedia Interface (HDMI) output for direct digital-audio and video connection to TVs or monitors with HDMI inputs. Microphone input Microphone input Microphone input is a jack for an external microphone to improve sound quality and prevent picking up noise from the camcorder. It is an alternative to using the built-in mike. Remote control Remote control Wearable wrist remote with button operated control, typically limited to video record, photo capture, and on/off. Built-in light Built-in light Built-in light provides illumination for close-ups when the image would otherwise be too dark, but it's no substitute for a well-lit room. Weight (lbs.) Weight This is measured in pounds and includes the recording media. LCD size (in.) LCD size This is the size of the image displayed on the LCD. With some models, the image does not fill the whole screen when recording. For these models, this number is smaller than the physical size of the screen.